April 2008 Friday 4th April. VH-DZY's flight testing began in earnest after it was moved from Wedderburn airstrip to Camden Airport for the duration of its test program. At the conclusion of the test program, the beast will be moved to its home at Bankstown Airport. With test pilot, Steve Curtis, at the controls, the bird rumbled out to the runway. Taxiing a Yak-50 requires full concentration. To turn, you have to apply rudder in the desired turn direction while carefully squeezing the brake lever attached to the joystick. e.g. apply right rudder while squeezing the brake lever generates greater force in the right wheel brake. Since the tailwheel castors freely when unlocked, it will happily swing the rear end of the bird to the left at the same time. To taxi straight ahead, you just straighten the bird with suitable differential braking, centralise the rudder pedals and then ease the joystick back to lock the tailwheel. To turn again, ease the joystick a little forward of neutral, and the tailwheel unlocks. This time at Camden, I was unable to get as close physically to the aircraft during takeoff. So I had to use a large zoom to pick up the bird at a distance. Unfortunately, without a tripod or monopod, it was difficult to avoid some "jiggling" of the video. 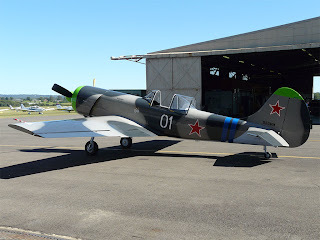 A Yak-18T aircraft owner, Rob Mangan, kindly offered to assist with some air-to-air photography by flying formation with Steve. So with me as photographer, we had some fun while conducting the bird's test flight. In this short clip, Steve is joining up on the Yak-18T's right wing. This clip shows the Yak-50 in a formation turn to the right and then eventually leaving the formation in a fun way. Steve brings VH-DZY in for a smooth touchdown before opening the throttle and taking off again. Several circuits were flown this way to establish suitable power settings for use in the circuit, as well as the preferred landing technique for this bird. All this flying leaves a big bird thirsty. So it came back to be refuelled and for Steve and I to discuss his findings so far.